The Tanoshiboy Chronicles: Design & Illustration Blog: In brightest day...in blackest night..."
In brightest day...in blackest night..."
So I was accused of hating DC. How that came about I do not know. And that statement couldn't be more wrong. I love DC comics. And two fo my favorite books right now, are Green Lantern and the Green Lantern Corp. 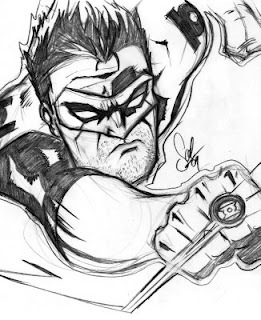 The first deals with Hal Jordan and the other houses the entire corp, including Guy Gardner, Kilowog (Gotta draw him soon) and my favorite GL, Kyle Rayner. So I thought I'd do a little sketch of the dude. He's my favorite because he's the artist GL. How cool is that? The upcoming storyline "Blackest Night" is sure to be awesome. Check it out.